Did you know that it snows on average, one foot every five days during the winter? Seriously. If that's not a reason to book your trip, how about the fact that 10 Utah resorts sit within an hour of Salt Lake City International Airport, and there are 98 non-stop flights offered daily? Do we have your attention yet? Here's your guide to picking the perfect basecamp for the greatest ski trip ever. The subtle differences of each resort and basecamp are detailed below to help you find the perfect area and resort fit for you. 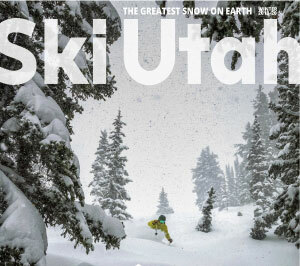 Before we introduce you to Utah's resorts, get a lay of the land from the map below. Hint north is located at the bottom and south at the top. The famous ski resort painter Jim Nehius intentiaonlly did this to emphasis and showcase Utah's desirable north facing slopes. 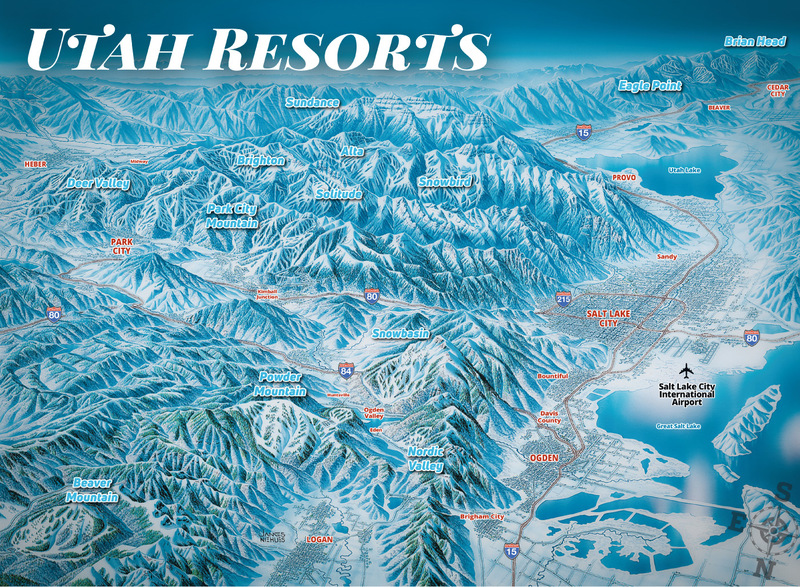 Download High Resolution "Utah Ski Resort State Map"
The envy of every other ski town, Park City is a mere 35 minutes from Salt Lake City International Airport. Once there, choose between Park City Mountain and Deer Valley Resort. Either way, you'll find plenty of après ski opportunities wandering Park City's Main Street with over 100 bars and restaurants. Big city life and deep powder together in one package. That's the beauty of Ski City. Stay downtown and be on top of Solitude, Brighton, Alta or Snowbird before you know it. All of these resorts feature incredible terrain and over 500 annual inches of The Greatest Snow on Earth®. So go ahead. Have the best of both worlds. For crazy amounts of untracked powder and nonexistent lift lines, try the Ogden region. Both can be easily found off the beaten path at Powder Mountain, Snowbasin and Nordic Valley. For a more beaten path, the town of Ogden and its historic 25th street are just 30 minutes away from all the skiing. Stay, dine and play right here. Experience a winter wonderland in an idyllic alpine valley. Just 45 minutes from the Salt Lake International Airport, the Heber Valley offers family fun, scenic mountain views and the awe-inspiring Midway Ice Castle. Just 12 minutes from the Deer Valley gondola or 20 minutes from Sundance Mountain Resort find your perfect ski getaway with Heber Valley. The Greatest Snow on Earth meets red rock at Utah's two most southern resorts: Eagle Point and Brian Head Ski Resort. Each just four hours from Salt Lake City International Airport and three hours north of Las Vegas by car. Both laid-back and wonderfully crowd-free. Home to Utah State University, Logan is an idyllic Northern Utah town cozily nestled within the beautiful Cache Valley. Thirty minutes east from there, just down Highway 89, is Beaver Mountain – the oldest family-owned-and-operated resort in North America. Perfect for families with kids or those looking for a true throwback. Fun to say and as breathtaking as they come, Mt. Timpanogos is home to the famed Sundance Mountain Resort. For a romantic getaway, incredible dining options or fantastic art classes, stay on the mountain or make the short journey 20 minutes to Provo – fast becoming famous in its own right as the Silicon Valley of the Rockies.